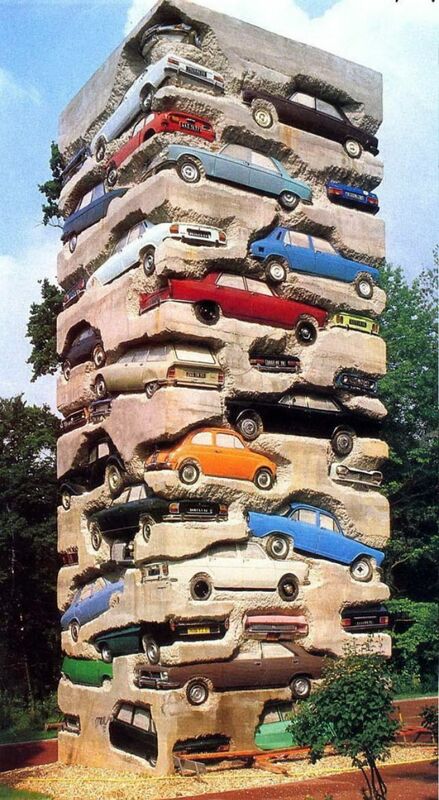 This is a sculpture called “Long Term Parking” and it is located at the Château de Montcel in Jouy-en-Josas, France. 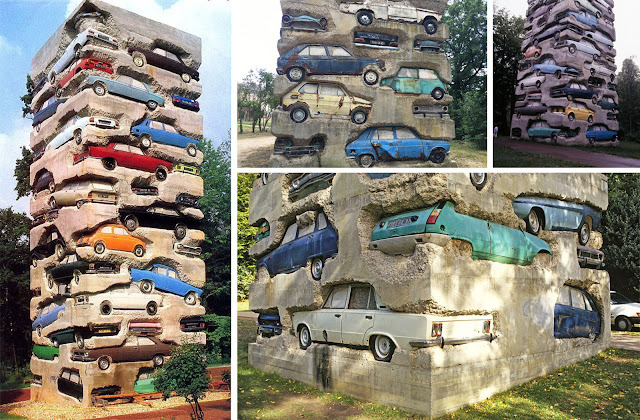 This 60 feet (18-meter) high sculpture consists of sixty mostly French cars set in 40,000 pounds (18,000 kg) of concrete. It was created in 1982 by a French-born American artist named Armand Pierre Fernandez (1928–2005), or simply Armand. Inspired by collages of Kurt Schwitters, Arman’s first solo show, in Paris in 1954, exhibited his “Cachets,” assemblages and accumulations of stamps and fabric. In 1960 he and other artists signed the manifesto of the “New Realism” movement. New Realism aimed for “new, sensitive, perceptive approaches to the real.” Arman began examining the artistic possibilities of everyday objects, giving them an importance never seen before - in effect, transforming garbage or abandoned items into art - yet another, more complex, interpretation of Pop-art. 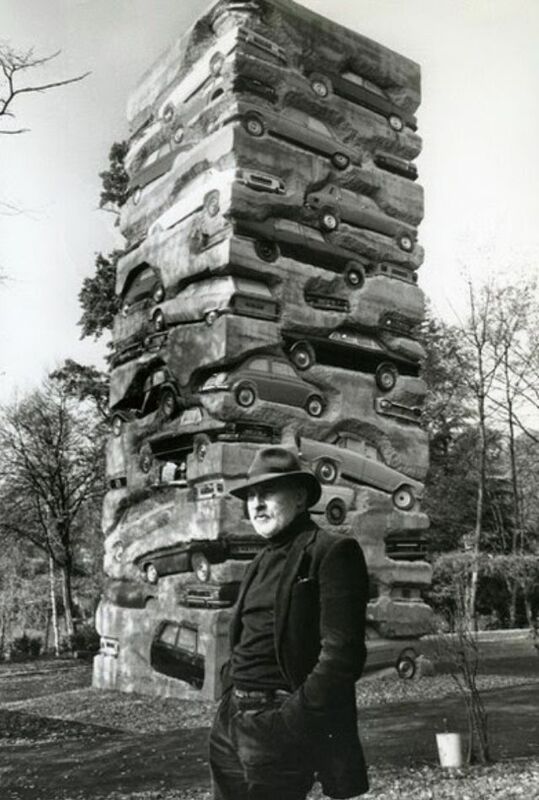 His style developed gradually, incorporating “colères,” (manmade objects smashed and reassembled, mounted on wood panels); “coupes” (slicing mass produced objects); and “combustions”: objects set ablaze, charred remains exhibited, aiming to represent acts of artistic creation through destruction. After spending time in New York, inspired by the energy of the city, he made a home there, became a US citizen in 1973, with the official name Armand Pierre Arman. More, and more ambitious, projects followed, including accumulations of tools, clocks and costume jewellery. Hundreds of pieces welded together into sculpted forms, some in miniature, some huge. The shapes of musical instruments inspired him too, to create accumulations and “coupes” of cellos, violins, and trombones. 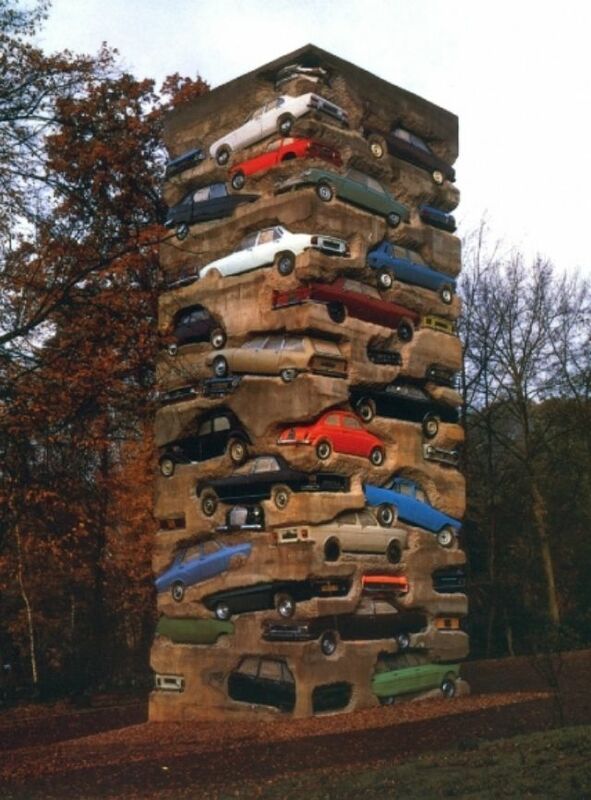 Arman was the first contemporary artist to receive commissions from the Renault car company; a collaboration resulting in a series of works using car parts which Arman exhibited at the 1970 World’s Fair in Osaka, Japan. 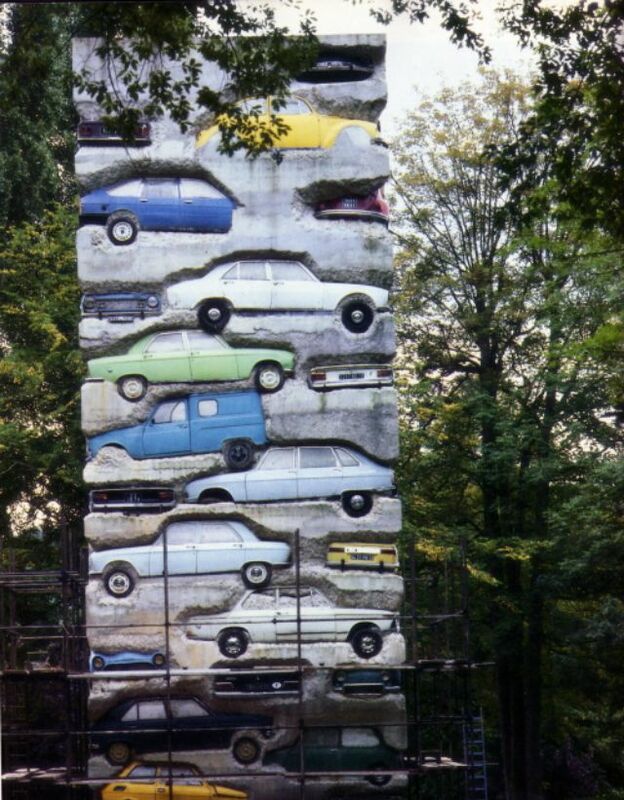 Arman created some monumental public sculptures. His “Long-Term Parking,” (1982) in a Parisian suburb, for instance: a 60-ft-high column of concrete encasing dozens of cars. Also, his “Hope for Peace”, commissioned in 1995 by the then Lebanese Prime Minister. 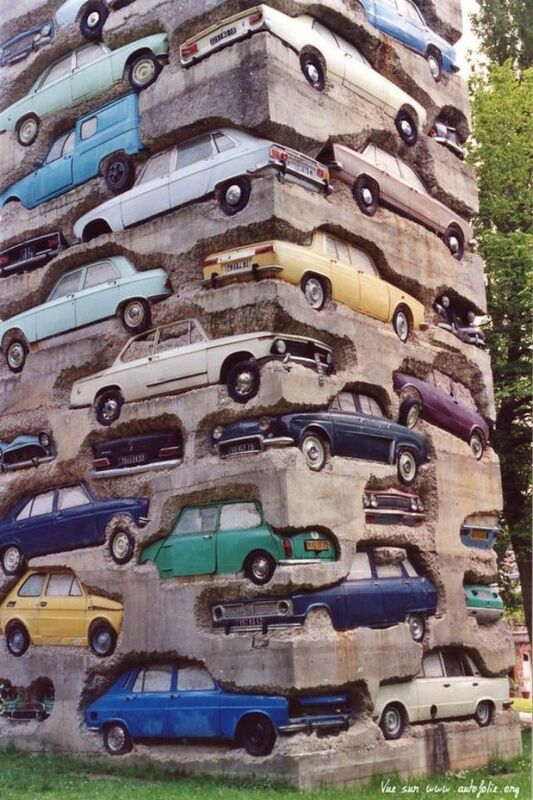 It stands alongside the Lebanese Army Headquarters in Beirut and towers even higher than “Long-Term Parking”. 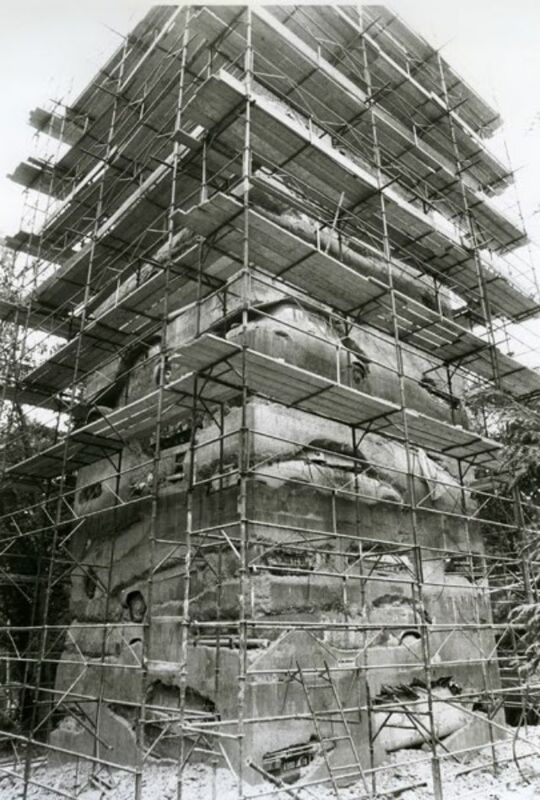 “Hope For Peace” encases armored vehicles and tanks, whose barrels poke out through the concrete, pointing upward. 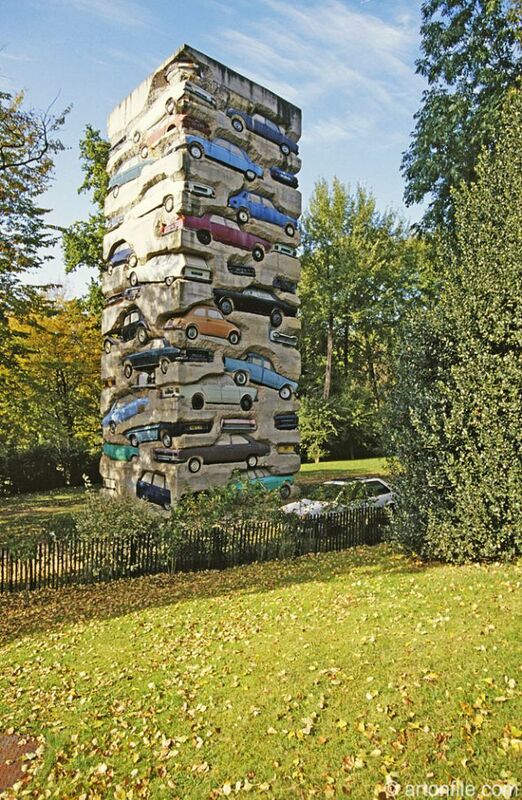 Later, Arman returned to painting. In 1991 he created a series of “robot-portraits” of classical composers, large-scale works evoking their subjects via assemblages of sheet music and instruments.